Is it really time to be thinking Back to School? Kids and families getting ready for the fall rush are in need of healthy, energy-packed foods to fuel tightly scheduled and hectic mornings. 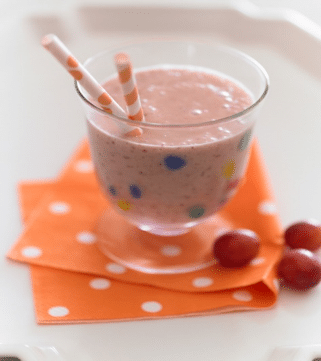 Here’s a recipe for a breakfast-to-go smoothie to start the day with a tasty blend of fruit, yogurt and crunchy cereal. Kids and adults too will relish this satisfying and delicious drink. Think of it as a nice way to keep alive the sweet taste of summer. Combine all the ingredients in a blender and blend for 1 minute. Serve immediately. Makes 2 1/3 cups of smoothie. Nutritional analysis per serving: Calories 251; Protein 6 g; Carbohydrate 57 g; Fat 1.5 g.